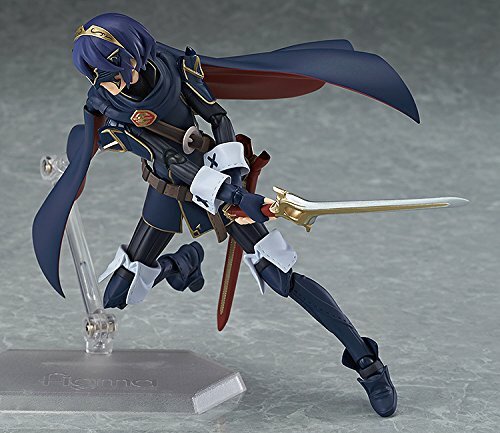 From a tactical role-playing video game, this is Fire Emblem Awakening Lucina Action Figma Figure from Good Smile Company. Using the smooth yet poseable joints of figma, you can act out a variety of different scenes. A flexible plastic is used for important areas, allowing proportions to be kept without compromising poseability. 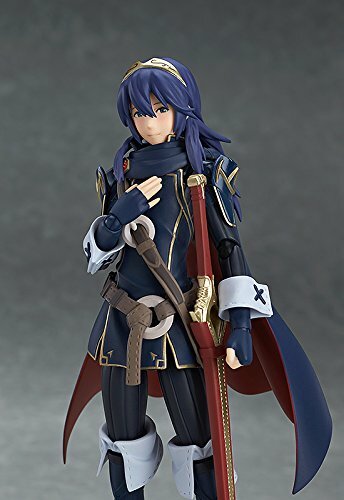 Lucina comes with both a confident staring expression as well as a gentle smiling face. Alternate hair parts allow you to display her as disguised at the start of the game. 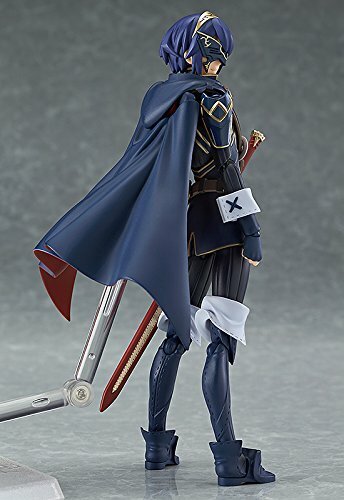 Her cape can easily be attached and removed, and special handle parts can be attached to the scabbard, allowing you to display her with her falchion sheathed. An articulated figma stand is included. 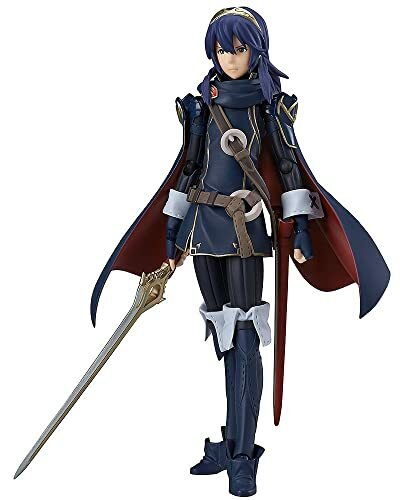 Lucina (ルキナ, Rukina) is Chrom’s future daughter, a playable character, and is one of the three main protagonists (tritagonist) from Fire Emblem: Awakening. Lucina is the daughter of Chrom from the future and has the mark of Naga, known as the Brand of the Exalt, on her left eye. She is a kind and determined princess with a strong sense of justice, who believes that saving the world is her mission. She loves her father dearly and is always worrying over him. Her sword, the Parallel Falchion, was originally thought to be a separate weapon from Chrom’s Falchion, but was later revealed to be a version of the same weapon brought back from the future. Her birthday is April 20th. Depending upon whom Chrom marries, Lucina can be the sister of Male Morgan, Inigo, Cynthia, Kjelle, or Brady, or be an only child. She is also Owain’s cousin and possibly Female Morgan’s cousin as well if the Avatar marries Lissa or Emmeryn. Upon arrival from the future, Lucina instantly comes to Chrom and Lissa’s aid when a Risen nearly kills Lissa. However, before Chrom can thank her, she temporarily leaves, leaving Chrom, Lissa, Frederick, and the Avatar to fight off the Risen. After the battle, she introduces herself as Marth and then promptly leaves, warning them of greater dangers to come. Later, during a tournament at Arena Ferox, Lucina defeats Basilio’s original champion, Lon’qu, thus becoming his new champion for the tournament. Lucina is a strong willed and driven woman who is determined to alter the dark future she came from. Due to the countless deaths and horrific events of the future, she dislikes any form of death, even “noble” ones. Her main motivations come from her love for her parents, especially Chrom. Lucina is willing to do whatever it takes to see that Chrom stays alive, even if it means going against her wish for no needless deaths. 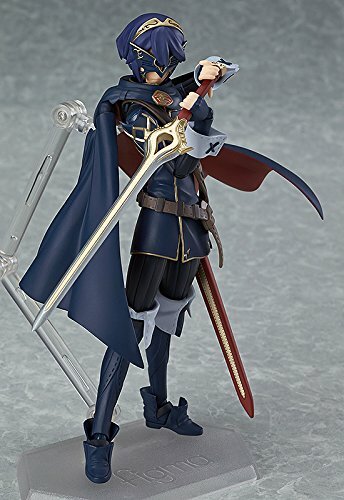 For fans of Fire Emblem Awakening don’t miss and buy this Fire Emblem Awakening Lucina Action Figma Figure for your adult figure collection with good price.